Simple Valentines ideas and crafts save money and time, preparing for the romantic holiday in February. 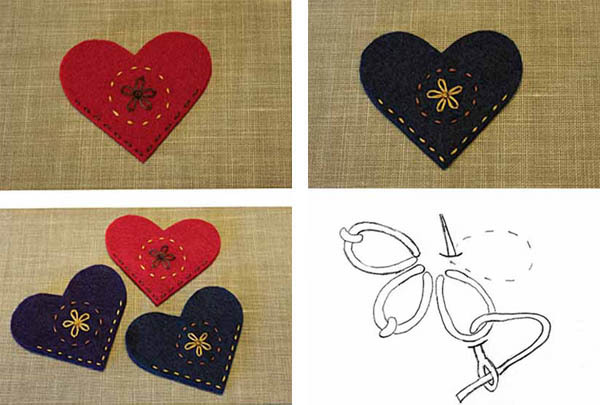 Felt hearts decorations are excellent, charming and quick to make craft ideas for Valentines Day gifts. Tender and warm hearts decorations, made of eco friendly felt are wonderful eco gift for the very special and loved bookworm in your life. This inspiring craft idea came from Alison at Simple Serendipities, offering the instructions for making felt hearts, unique gifts for your Valentines. Elegant, made of soft fabric bookmarks are attractive hearts decorations that will bring more joy and love into your Valentine’s life, showing your love and appreciation. It is a pleasure to make these decorations of felt, creating eco gifts that will bring smiles, surprise and delight a special person in your life on Valentines Day. Creative and easy to make felt heart bookmarks are excellent Valentines Day crafts, that are inexpensive and unique, attractive and eco friendly. 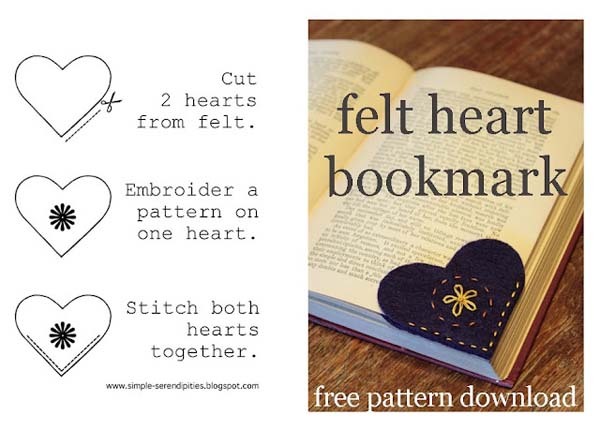 Cut two hearts from felt in pink, red, purple or any other color, Embroider a flower pattern on one heart, which will be the top part of your bookmark, and then stich both hearts together at the bottom. Embroidery is a fun detail to add to hearts decorations. You can embroider a flower, another small heart or name or initials, making bookmarks more personal and special.